As we’ve mentioned before, this trip is not really a vacation but rather an opportunity to explore different areas in a couple of regions that we have identified as potential retirement locations based on previous experience and much research. Every so often throughout our stay, we plan to head out in one direction or another to visit the towns and cities in the area as well as take in the landscape and environment in an attempt to find out what appeals to us the most. By the end, we hope to narrow down our choices to one or two places where we would like to spend more time next summer and get to know even better. France is about the size of Texas. It’s divided into regions which you might think of as states. Each region has several departments; think of these as counties. 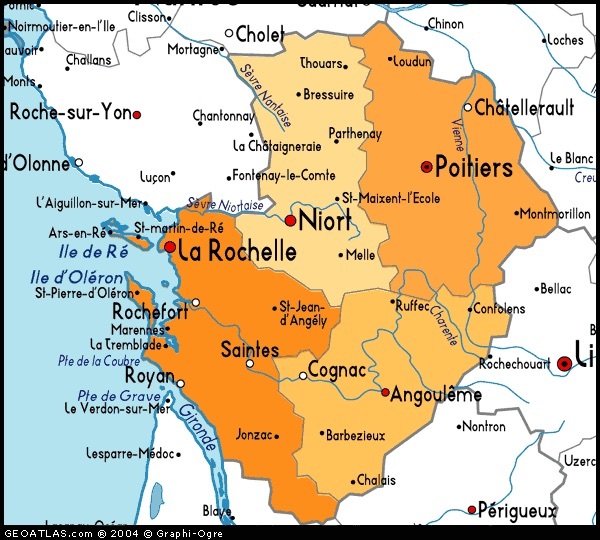 There are currently 22 regions in France and we are focusing our research on two of them — Poitou-Charentes and Aquitaine. However, as of January 1, 2016, all the regions will be consolidated into 13 in an effort to reduce administrative costs throughout the country. 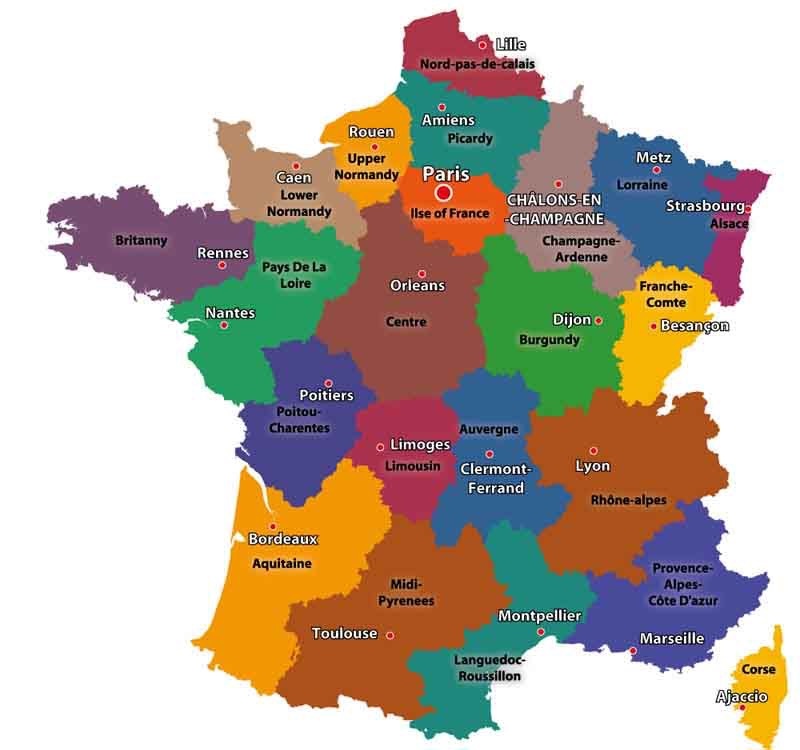 So, next year, we will be returning to the combined region of Aquitaine-Limousin-Poitou-Charentes. Whew! That’s a mouthful. These are interim names and, at some point, they will have to agree on more manageable names for each of these “super regions”. I am uncertain as to whether or not we will notice any change other than the official label as the French are fiercely proud of their individual identities and, truthfully, that is what makes the country so diverse and uniquely interesting. Today we set off on another “reconnaissance mission” in the region of Poitou-Charentes. Beginning in our current location near Segonzac inthe department of Charente, we traveled west toward the Atlantic and completed an 80-mile loop that included five major towns/cities. This took us into the department of Charente-Martime, which, as its name implies, borders the western coast. Our first stop was in Barbezieux (pop. 4,600), one of many towns with an imposing chateau as its central landmark. It is set on a hilltop which makes it pleasantly inviting. We spent our time walking through the small but adequate outdoor market set up along several narrow streets that were lined with a variety of shops and boutiques. From here we moved on to Jonzac (pop. 3,500), best known for being a spa town where thermal waters that were discovered about 30 years ago draw thousands of visitors each year. It seemed rather nondescript and didn’t really attract our attention. We stopped for a pastry and then continued on our journey. Next, we visited the town of Pons (pop. 4,400) which sits high on a hill overlooking the Seugne River. 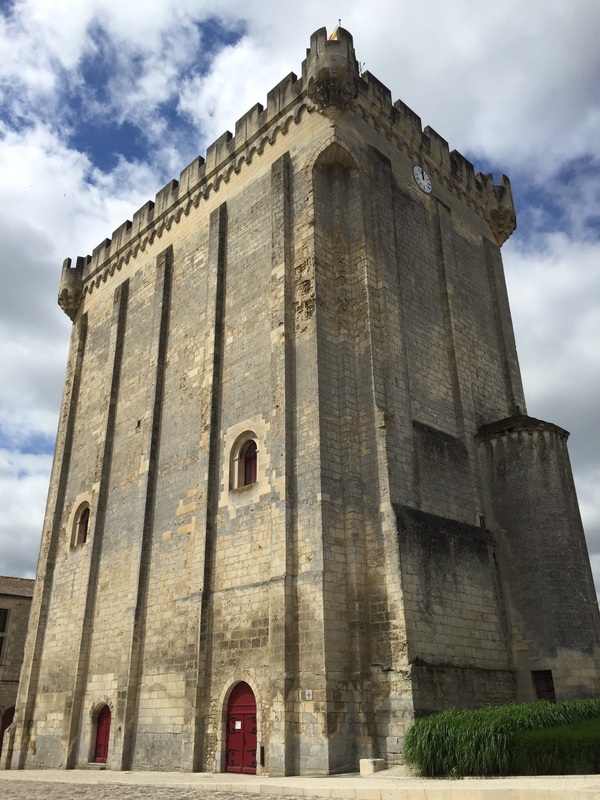 Its central square, La Place de la Republique, is dominated by an massive donjon, or castle keep, established during the Middle Ages by the Lords of Pons. We particularly liked the setting and location of this town along the river and were impressed with its beauty. 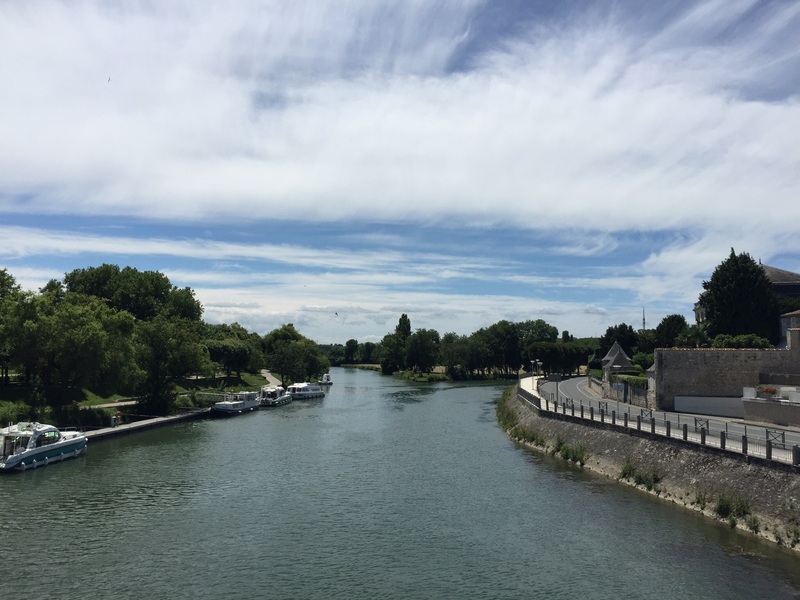 A planned stop for lunch in Saintes (pop. 26,500) situated on the banks of the Charente River turned out rather well. We made our way to the old town center with its extensive pedestrian area and stopped to eat at La Musardière, a Spanish tapas restaurant, set in a welcoming courtyard next to the Musée de l’Echevinage and its clock tower. Afterwards, we walked through some of the streets and took in the sights. Saintes is surrounded by many small towns which are adjacent to it. It is a transportation hub connected by several major highways and roads making destinations such as Bordeaux, Poitiers, and even Paris easily achievable. We could imagine ourselves living someplace quiet on the outskirts of this area far enough to avoid the city noise and have plenty of space around us but close enough for easy access to services and cultural activities. Turning back east, we arrived in Cognac (pop. 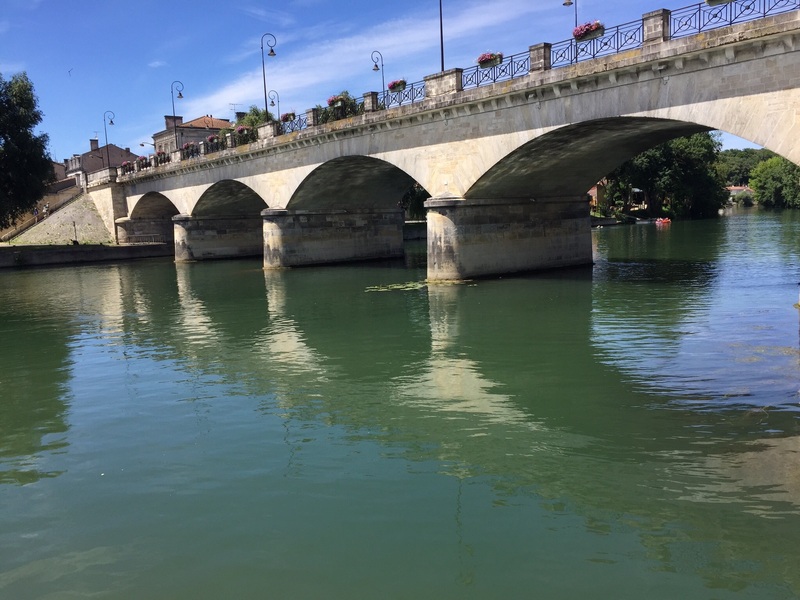 19,000) and parked along the quai of the smooth-flowing Charente River that is punctuated by a beautiful arched bridge. This is the location of several of the major Cognac producers such as Hennessy and Camus. The river banks are lush, green, and inviting and we saw several people relishing the day in their rented canoes. Then we drove to the central square, La Place François 1er, with its own unique pedestrian area and enjoyed some delicious French ice cream. Somewhere outside of Cognac would probably be equally as appealing to us as Saintes. Finally, it was time to return home to our gîte, Le Cerisier, have dinner, and sort out all that we had learned from our expedition. Admittedly, we didn’t spend very much time in any of these places, but first impressions are important and at least, we came away with more of a sense of what we do and don’t want for the location of our future home in France. We’re kind of like Goldilocks when she is testing out the Three Bears’ chairs, porridge, and beds — too this, too that, ah, this one is just right. Hopefully, by the end of our time here, we will find one or two places that will seem “just right”.